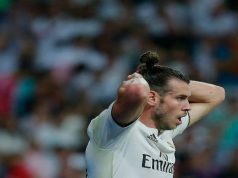 Real Madrid’s poor start to the La Liga season continued with a home loss against city rivals Atletico de Madrid, who gained some revenge for the Champions League defeat in May. The return of Cristiano Ronaldo to the starting line-up boosted Los Blancos, but even a penalty won and scored by the Portuguese front man wasn’t enough to prevent Los Colchoneros taking home the three points and leaving Carlo Ancelotti with plenty to ponder after just one win in three league matches. Much was made of the physical nature of Diego Simeone’s men in the build up to the game, and once again they showed they were up for the challenge throughout this encounter. In the 10th minute, Tiago rose highest to head home a Koke corner and give the champions the lead. Questions will once again be asked of the Real defending however and won’t quieten the critics who have claimed this season’s side is weaker than last year’s. 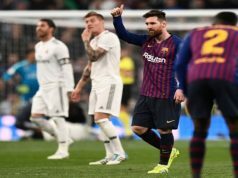 The home side responded, and Ronaldo once again showed he was the man for the big occasion, leading from the front and being the hub through which every Real attack went. The 29-year-old won a penalty in the 25th minute after Siquiera had come in with a late challenge in the box. He picked himself up and dispatched it past Moya in the Atletico goal. Real had plenty of chances to go ahead, with Karim Benzema particularly wasteful infront of goal. Gareth Bale and James Rodriguez were quiet throughout and Toni Kroos was played in an unfamiliar holding midfield role. The second half was more of an even affair but as it wore on, both teams went for the three points. And Atletico proved to be the more clinical side. Seventeen minutes from time, Turan swept home past Casillas to sent Colchoneros fans into delirium. The hosts puffed and panted in the closing stages looking for an equaliser, but this Atletico team proved why it has earned a reputation as being one of the best sides in Europe when it comes to holding onto a lead. 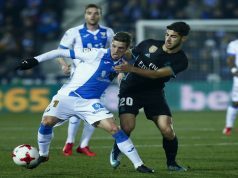 Ancleotti and his men have plenty of work to do now in La Liga and at this early stage some doubts will be there as to whether they can keep pace with Atletico and Barcelona.